Deering didn't play like the top seed in their quarterfinal against Marshwood. Through halftime of their semifinal match-up against Sanford, they still didn't. However, a commitment to defense int he second half propelled the Rams to a 51-45 win over the underdog Redkins. Sanford started the game hot, jumping out to a 6-0 lead on high-percentage baskets from Shae Riley, Lindsay Nolette, and Taylor Flood. Deering than returned the favor, finishing the quarter on a 10-0 run, taking an 12-11 lead. Deering's star player, Kayla Burchill then took over in the second quarter. Burchill scored 9 of her 21 points in the quarter, as the Rams opened up a lead. Sanford would fight right back, as Riley paced the Redskins with 6 points in the quarter. The teams were knotted up at 23 all heading into halftime. Ella Ramonas keyed Deering's big third quarter, scoring 5 points early. Marissa MacMillan and Chelsea Saucier shipped in 4 points a piece as Burchill was quiet offensively in the third. Flood had 6 points for Sanford, but it was Deering with a 38-32 lead heading into the fourth quarter. Sanford made some big plays to try and get back into the game, but they weren't enough to match Burchill. 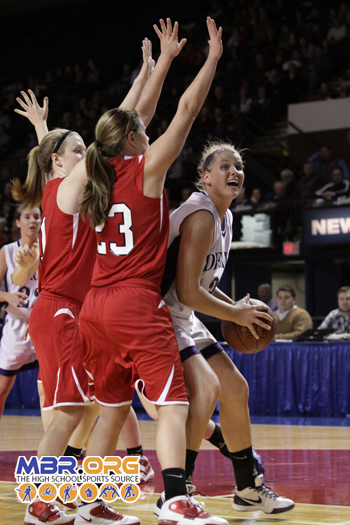 Riley hit a 3-pointer, and Flood and Heather LeBlanc had And-1s, but LeBlanc missed the free throw both times. Burchill had 7 points in the quarter as the Rams kept just enough distance to complete victory. They will now play for the Western Maine Class A Girls title on Monday night.